A former energy executive in Vermont has taken a major step towards becoming the first ever transgender governor of a US state. Christine Hallquist defeated three other candidates, including a 14-year-old boy, to win the Democratic Party nomination on Tuesday. She will now face the incumbent Republican Governor Phil Scott in the general election in November. Her nomination came on a night of firsts for primary elections. A former Somali refugee won her race in Minnesota, as did a celebrated teacher in Connecticut who could now become the state's first black Democrat in Congress. Democrats are hoping for a "blue wave" in the midterm elections to regain control of at least one chamber of Congress. Ms Hallquist's nomination comes in an election year already marked by record numbers of lesbian, gay and transgender candidates. There are also a record number of female candidates in elections for governor and for the House of Representatives. 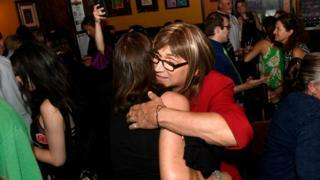 This year, 43 transgender candidates have run for political office at all levels in the US. But Ms Hallquist is the first transgender person to win a major party nomination for state governor. "I think Vermont is a beacon of hope for the rest of the country," she told Reuters news agency after the result was announced. "This is what I call expanding our moral compass and that is what I think it represents." She added: "I love Vermont because we look beyond these surface issues. I just happen to be a leader who is transgender. Vermonters know that." Ms Hallquist defeated Ethan Sonneborn, 14, a schoolboy who was allowed to stand because the state's constitution has no age requirement for the governor's job. She also beat a Navy veteran and the executive director of a dance festival to clinch victory. There were a number of other significant victories on Tuesday. Ilhan Omar, a refugee from Somalia who came to the US as a teenager, won her Democratic primary in the state's fifth district. The victory puts the 36-year-old in a strong position to become one of the first female Muslim members of Congress in November. "Tonight, we are celebrating because we engaged and empowered our community and we won," she tweeted following her victory. Jahana Hayes, who was named national teacher of the year in 2016, won the Democratic nomination in a western district of Connecticut. 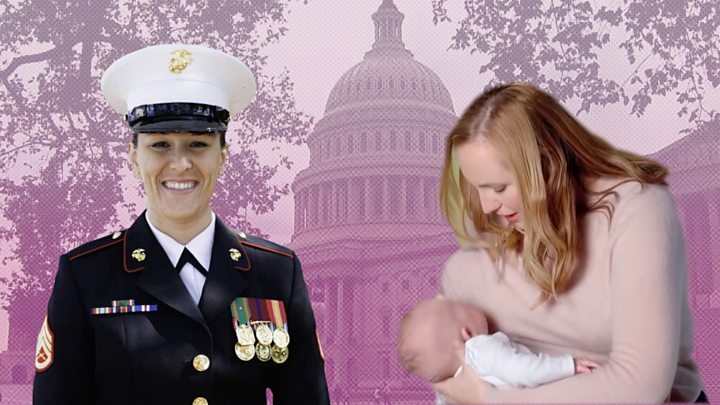 She will now contest the seat vacated by Elizabeth Esty, who resigned after a sexual harassment and misconduct scandal came to light in her office. Ms Hayes's victory marks a significant step towards her becoming the state's first black Democrat in Congress. Ex-presidential candidate Bernie Sanders cruised to victory in Vermont's Democratic Senate primary, paving the way for him to serve a third term. The 76-year-old hasn't ruled out a second run for the presidency in 2020. But he is expected to decline the Democratic nomination and run as an independent candidate with the party's backing, as he has done previously. If elected in November, Mr Sanders would extend his run as the longest-serving independent in US congressional history. In Minnesota, a key battleground state, Republicans opted for the party's county commissioner Jeff Johnson in the governor primary. But Mr Pawlenty alienated the US president's supporters after once calling Mr Trump "unhinged and unfit". A Trump loyalist, Kris Kobach, was declared the winner of a Republican primary for Kansas state governor, a week after voters went to the polls. Kris Kobach ousted the current Republican Governor, Jeff Colyer, by just 345 votes. Minnesota Congressman Keith Ellison won the Democratic primary for attorney general, after denying abuse claims that surfaced days before the vote. His ex-girlfriend alleged at the weekend that she had been assaulted and emotionally abused by the first-Muslim US congressman and deputy chairman of the Democratic National Committee. "We had a very unexpected event at the end of this campaign that happened," he said. "I want to assure you that it is not true."